Average rates offered on new credit card accounts for small-business owners rose in the last two weeks while rates offered to consumers and students remained the same. The average rate for non-reward business credit cards jumped more than half a point to 14.47 percent from 13.75 percent. 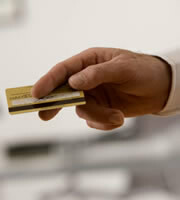 Average rates for business reward credit cards stayed the same at 15.92 percent. Many entrepreneurs rely on credit cards for financing, especially now with conventional bank lending still tight. Higher rates make it tougher for business owners to get the money they need to grow and meet cash flow challenges. Business credit cards were not included in the Credit CARD Act, the overhaul of industry regulations signed into law by President Obama in May 2009. Some of the new rules, such as a requirement to give consumers advance notice for interest rate increases on existing accounts, went into effect a year ago, while the bulk of the regulations took effect in February this year, including a ban on interest rate hikes on existing balances unless card holders are more than 60 days late on payments. Limits on how much issuers can charge for penalties, such as late fees, go into effect this month. The slew of impending regulations, on top of rising defaults, spurred credit card companies to hike rates on existing accounts last year before new rules took effect, and to raise rates they offer to new customers. The overall average rate for new consumer accounts now is more than one and one-half points higher than the overall average of 14.99 percent for reward and non-reward cards just one year ago. Meanwhile, many issuers have moved from offering fixed rates to variable rates, so most of today's cards are based on a margin on top of the prime rate--now at a low 3.25 percent. Once the prime rate goes up with further economic recovery, variable rates will rise correspondingly. Student credit card rates have been going up in the last year, too, although today's average of 16.23 percent is slightly lower than the overall consumer rate. It's still unclear how the Credit CARD Act's limits on student credit cards will impact the market long term. Issuers can't market credit cards to college students on campus or give away freebies for filling out applications. To get a credit limit over $500 students must get an adult cosigner unless they can show they have regular income to pay their bills. Many issuers offer tiered rates according to consumers' credit ratings. A single card, for instance, might offer four different rates, with the lowest reserved for consumers with the best credit scores and the highest rate for customers with mediocre or poor credit. The IndexCreditCards.com survey takes into account all the rates offered for each card to pinpoint a single average, and it tracks rates at the lowest tier for consumers with excellent credit. Average rates for these consumers overall is now 12.92 percent. To break it down further, the average reward card rate for excellent credit is 13.68 percent, and the average non-reward card rate for those consumers is 11.17 percent. 0 Responses to "Credit Card Interest Rate Monitor Archive - August 15 2010"